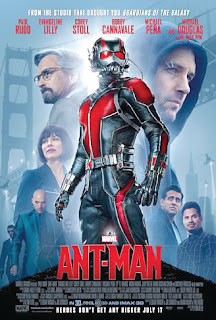 Ant-Man is a new superhero movie that follows Avengers: Age of Ultron as the twelfth installment in the absurdly successful film franchise of the Marvel Cinematic Universe. The movie stars Paul Rudd (Anchorman, The 40-Year-Old Virgin) as the title character alongside Evangeline Lily, Michael Douglas, Corey Stoll, Bobby Cannavale and Michael Pena. As a huge fan of the Marvel movies and comic book films in general, I was really looking forward to seeing how this lesser known character would adapt to the big screen. However, I knew heading into the theater that this movie wouldn’t be on the same massive, epic scale of some of the more recent films from Marvel Studios. In the end, Ant-Man did exactly what I expected it to do, literally shrinking the title character, as well as the stakes of the story, while not changing the quality of moviemaking. Scott Lang (Paul Rudd) is a master burglar just released from prison. 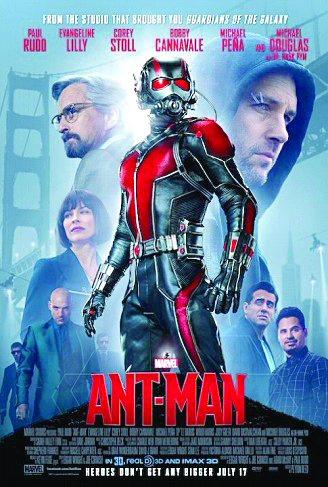 Struggling to find a job due to his criminal record, Lang decides to break into the house of a famous scientist named Hank Pym (Michael Douglas) in order to steal money from a safe. Instead, Lang discovers a suit in the safe, which he soon realizes allows him to shrink down to the size of an ant while gaining superhuman strength. Now, Lang must work with Pym to learn how to control his newfound skills in order to prevent Darren Cross (Corey Stoll) from abusing the power of the same technology in the form of a “Yellowjacket” suit. Overall, I had an absolute blast watching Ant-Man. As I mentioned earlier, it wasn’t exactly on the same world-ending scale of movies like Age of Ultron¸ but it was still an extremely entertaining experience nonetheless. Primarily a comedy star, Paul Rudd turned in an excellent performance in the lead role while working in plenty of his signature humor. The rest of the cast did great too and Michael Douglas delivered his most memorable performance in years. Furthermore, there were plenty of awesome action scenes to keep the story moving and the visual effects used for the Ant-Man sequences were absolutely stunning. With a seemingly endless string of unique ideas, it truly didn’t surprise me that Marvel managed to deliver yet again with this movie. Don’t let the small size of this hero fool you, Ant-Man is an unbelievably exciting superhero movie that certainly shouldn’t be missed.